And that's a rap. Social Media Marketing World has officially wrapped up for 2019. The last day of the conference was actually March 22, but there were a ton of lunches, meet ups and Facebook Lives immediately following and truth be told, our brains were on overload with all the golden nuggets that we absorbed. We needed time to digest and organize all that information. First up to bat (hey, it's Baseball Season!) is my recap from Viveka Von Rosen's session on what else... LinkedIn! I’m a huge fan of Viveka’s and was nervous to even introduce myself to her last year at the conference, but this year I felt like we were old friends! 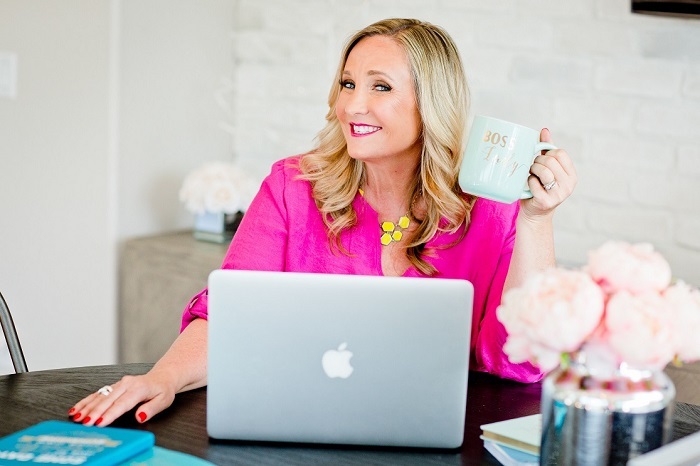 Viveka is a Linkedin Expert and international speaker and all around fabulous human! Most content is locked down to about 10% of your network - YIKES! You need views, likes and shares in the first 10 minutes to get your post ranking higher in the algorithm. Create a sharing HUB to drive engagement in the first 10 minutes. This keeps your post ranking higher in the algorithm I do this in my private group, The LinkedIn Bakery. Join us and learn how a POD can help your business. Photos, documents, and PPTs drive considerable traffic. 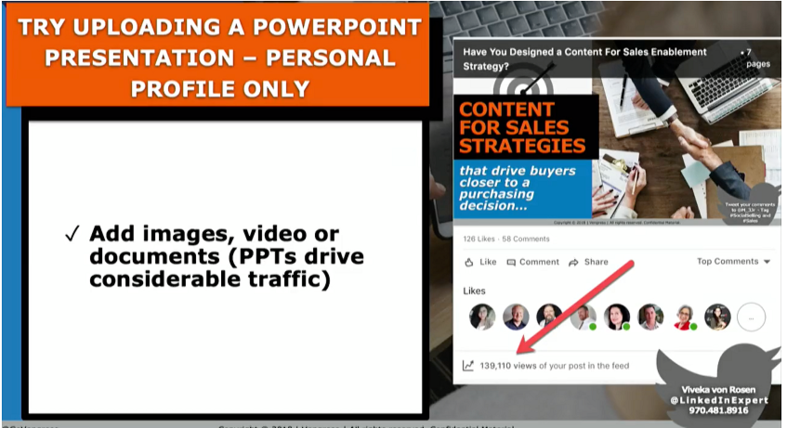 I was surprised to hear that PowerPoint's still drive traffic but they do, so start sharing them in your posts. LinkedIn loves its new toys - so use them when they bring it out! How many Hashtags should you be using on LinkedIn? Vivkea, said 3 is sufficient, it's not Instagram folks! What kind should you use? Look at hashtags on the left side of your home page to see what's trending. Make up one that is only relevant to you. I use#liconnectors. My group came up with it so we can find each others posts and articles on LinkedIn. Next up is a fabulous recap by Karlyn Williams on Dennis Yu's session on Facebook Ads. Who’s ready for recaps round 1!? First in the ring is Dennis Yu, the CEO of Blitzmetrics. During his session at #SMMW19, he took a deep dive into Facebook ads for local businesses and how to drive not just sales, but store visits bridging the gap between digital doors and physical doors. I couldn’t agree more with this sentiment, and often local business owners want that instant gratification that immediate sale, but in today’s world marketing to get the sale to a potential customer who has no idea who you are…well, you’ll lose every time. Now let’s get into my top takeaways. According to Yu, there’s a lot of people running Facebook ads, or “baking” on Facebook and they get mad at the oven. But what they’re not doing is following the recipe by putting the right ingredients into their Facebook ads in the form of one-minute videos with intentional messages to meet customers where they are in the buyers’ journey. The cold conversion is expensive and often doesn’t work for a local business who are trying to increase the foot traffic into their brick and mortar businesses. A cold conversion is simply a one-touch method to get the sale. Yu and his crew believe in the multi-touch method with videos that nurture the customer to the conversion. Why (Awareness) – This video should explain the why behind what you do. This type of story should be light-hearted and pull at the heartstrings a bit while also drawing people into you. Why? Because people buy from people. What (Conversion) – This video should position your product or services as a solution and ask for the sale. Showcase your evergreen offers or do a product demo. To have different videos to test within your advertisements, Yu recommends doing three videos for each step of the funnel. A big mistake Yu sees with many local businesses is they’re constantly advertising a seasonal sale, when in reality they should be trying to push evergreen content, content that doesn’t rely on a season or national holiday. The topics you fill in should be evergreen and should tell a story from actual people within your company. The stories from these people carry more weight on a customer’s decision than anything a logo could share. These videos don’t need to be high-production; they can be selfie-style and shot with an iPhone. The more behind the curtain access you give your audience, the more relatable you are – it’s how people connect. We’re all in personal sales in the social space. By the end of the session, Yu challenged those in attendance to record a one-minute video of their own to post on Facebook or LinkedIn and share the link with him and his team. In return, he gave away his top courses free of charge. I’ve read through those materials and consumed some of the course content already and have already put some of the tips into action for clients I’m working on ads for right now. Now I challenge you to do the same! If you’re wanting to be held accountable for doing one 1-minute video per week, join our Facebook group All-In April: Video Editions. Rounding 3rd is Cathy Kaczmarczyk with her recap How to create engaging Instagram Stories from Sue B. Zimmerman. Why should Instagram be a part of your strategy? The discussion begins here as Sue explains how Instagram is the most engaging platform between brands and their customers. It is 10x more engaging than Facebook, 54x more than Pinterest, and 84x times more than Twitter. While we are here to discuss Stories today, Sue briefly reminded the audience that it is still extremely important to participate in all “4 Neighborhoods” in order to maximize your Instagram influence. Just like your brand needs consistency, so does your Instagram business page. While most of us understand how the ‘Feed’ works, not everyone knows how to properly take advantage of ‘Stories’. Getting started is always the hard part - right?! The best way to start organizing material is to create a storyboard. Tools such as Trello are a great place to start planning out your strategy. It is extremely important to make sure we are telling our story and aligning with our ‘4 Neighborhoods’. What should your story include? First off, it is important to know that Stories can either be an image or video. We want to make sure we are using both types of content. Once we nail down our storyboard and content, we now want to make sure the content design is aligned with our brand. Video is always going to get higher engagement, but graphics and pictures are still a great option! Whether it is video or a graphic you can upload directly items directly from your phone to the Instagram platform. Some tools you can use to create Story graphics include, Canva and Unfold. Fonts: if you are typing directly in Instagram Stories you will not have many options for the text style. However, it is important to use the same text style and color in all your posts. Polls: What more engagement? Add a poll to your Story! It is important to make sure we are asking an open-ended question (avoid yes/no questions) and get your audience interacting with you! Location Sticker: What to get your story seen on through multiple IG channels? Add your location! For example, while I was at Social Media Marketing World, I made sure to tag my Stories at that location. Not only was my Story on my Instagram page, but it also showed up in Social Media Marketing World’s story. How cool is that?! Hashtags: Just like it is important to add hashtags to your feed, it is important to add hashtags to your story. Adding hashtags can also get your story seen more just like locations. While at Social Media Marketing World, I used #SMMW19 on all my Stories and received extra viewers through that hashtag. @Mentions: You have the opportunity to tag up to 10 accounts on each Story. This is great if the content is relevant to that person/account. You most likely will not be tagging 10 people every time. Swipe Up feature: This feature is only available to accounts with 10,000 + followers. It is a great opportunity because it allows your customer to click on your link directly! Now your Instagram Story is ready to post! To wrap up, I added an Instagram Story graphic to share why Instagram is important according to Sue. The feel to the beginning of Jenn Herman’s session was very 101-ish, which surprised me because I know she possesses very in-depth knowledge of Instagram - she literally wrote the book “Instagram for Dummies!” Although, once she got going, she shared valuable, quick and easy tips that we can implement right away to improve any brands Instagram strategy. This is what I’m going to share with you! Enhance your Name Fields - There are only 2 searchable fields in Instagram: your Instagram username and anything you put in the name field. Jenn’s name field says “Jenn Hermann 📱Instagram Expert” Make sure your username matches other social profile handles. Utilize your name field to include your specialty. Analytics Tracking - Google Analytics tracks any link from Instagram as “direct” and is not helpful. Bit.ly links will get you much greater opportunity to analyze clicks from Instagram. Humanize your Bio - Include personal characteristics in your bio, not only company facts. This helps people relate to you and ultimately how you build connections, which is what Instagram is all about. Captions Length & Tips - 1-3 short paragraphs is ideal for an Instagram caption. Awesome idea: add your @usename along with your Call to Action at the bottom of your post to make it easier for a follower to click back to your link. If you’re an excellent copywriter, you may be able to get away with one-liners, but most need more explanation. How Often to Post - As a B2B brand, do not post every day. A few times a week is sufficient. Focus on interacting with those commenting on your posts and viewing your stories. Building connections and relationships with your followers is the opportunity here. Instagram Stories - Make sure your “Reshare Sharing Stories Setting” is turned on. Optimum story is 5-7 posts. Make sure to follow @jennstrends on Instagram as she always posts informative content, trending topics and busts any rumors going around - which I love the most!Social Media Marketing World Simplified Jenn did not focus too much on hashtag or content strategy during this session. If you need help with either of these parts of your Instagram strategy, please do not hesitate to reach out to me on Instagram @capitalizesocialmedia. 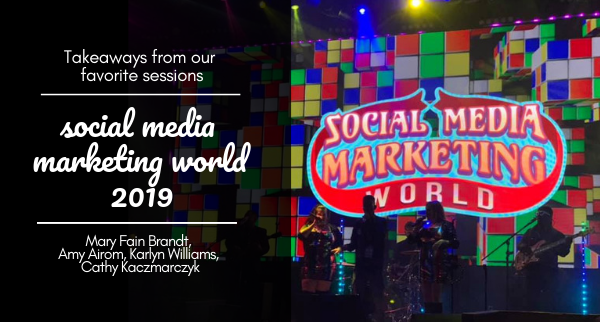 Looking for more takeaways from #SMMW19, check out next week’s version of Social Media Marketing World Simplified!